The special series that cares for young skin that is prone to acne and blackheads. - Ribwort and mahonia extract also help to prevent the signs of skin inflammation. - These plants contain acteosid and berberine, which are antibacterial. - Salicylic acid is keratolytic (it breaks down hardened skin e.g. on blackheads) and prevents blockages of the sebaceous glands. This enables the active ingredients to penetrate to the blackhead. The excellent effect of this three-phase active ingredient that improve impure skin has been confirmed by in-vivo measurements on 20 test persons. The products in this series are all made without chemical preservatives, mineral oils and PEG´s. no animal testing, vegan and mild cleansing foam with surfactants based on renewable raw materials that protect the skin from contamination. Mild cleansing product with surfactants based on renewable raw materials that gently frees the skin from impurities and make-up residues. 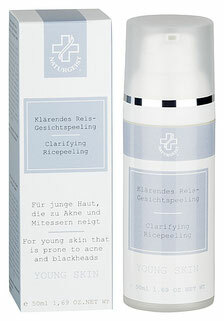 The incorporated three-phase active ingredient supports the reduction of skin impurities such as spots and blackheads. Thanks to the unique type of application, the products is hygienic and easy to use. Moisten face and apply cleansing foam. By circular movements of the fingertips distribute the product on the face and loosen the impurities. Then rinse thoroughly with clear, lukewarm water. 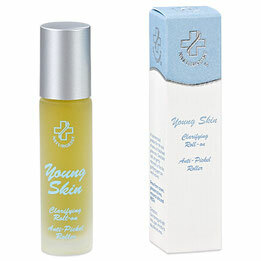 Then apply Young Skin Clarifying Facial Tonic, Roll-on and Cream. no animal testing, vegan tonic for the care of the skin prone to acne and blackheads. 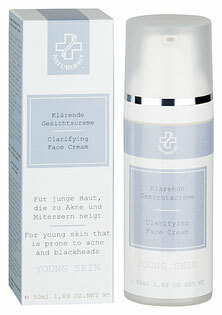 Clarifying face tonic, with a unique "Three-Phase-Agent" suitable for the care of acne and blackhead prone skin. The skin is prepared for the maximum effect of the products to follow, Young Skin Roll-on and the face cream. 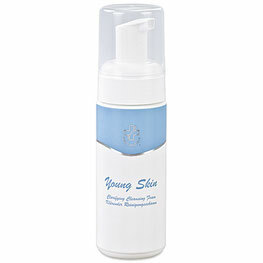 After cleansing the skin, apply Young Skin Clarifying Cleansing Foam to the face with a cotton ball and leave on. In case of heavy soiling of the skin, a pre-cleansing of the face can also be done with the Young Skin Clarifying Facial Tonic. no animal testing, vegan rice facial peeling, the incorporation of natural rice peeling grains, the skin is gently freed from keratinization. A product specialised in treating skin prone to acne and blackheads. Through the combination of rice peeling powder-grains, the skin is gently freed from dead skin cells. The “Three-Phase-Agent” is then able to work more effectively. In addition to this, the skin is nourished with almond oil, shea butter, vitamin E and moisturizer. Apply cream on cleansed skin and massage with circular motions. Remove leftovers with lukewarm water and then apply Young Skin Clarifying Roll-on and Face Cream. The exfoliation should be done every 2-3 days. tierversuchsfreie, vegane Gesichtscreme speziell zur täglichen Pflege der zur Akne und Mitessern neigenden Haut. tierversuchsfreier, veganter Anti-Pickel Roller zur direkten Anwendung auf den Mitesser oder Pickel. Die konzentrierte Pflege der zur Akne und Mitessern neigenden Haut. Die Applikationsform erlaubt eine punktuelle Anwendung des Produktes direkt auf den Mitesser oder Pickel. Verhornungen über dem Mitesser werden gelöst, so dass die Wirkstoffe direkt eingreifen können. Es wurde nur ein sehr geringer Anteil an Alkohol eingearbeitet, um das Austrocknen der Haut zu verhindern. Produkt morgens und abends direkt auf die betroffenen Stellen auftragen. tierversuchsfreie, vegane Peel-Off Maske. Reinigende, klärende und erfrischende Abziehmaske speziell für großporige und ölige Haut. Reinigende, klärende und erfrischende Abziehmaske speziell für die großporige, ölige und zu Pickel und Mitesser neigende Haut. Der eingearbeitete Weidenblätterextrakt enthält natürliche Salicylsäure, welches die Vorhornung über den Pickel und Mitesser löst. Dadurch kann das enthaltene Teebaumöl antibakteriell einwirken. Meeresschlamm beruhigt die Haut und schenkt ihr einen weichen Teint während ein Hauch von Menthol sanfte Frische entfaltet. Ca. 30 g (entspricht ca. 4 gestrichene Esslöffel) in eine Schüssel geben und mit 90 g Wasser (ca. 12 Esslöffel) zu einem klumpenfreien Brei anrühren. Mit einem Pinsel oder Spatel messerrückendick auf die gereinigte Haut auftragen. Ca. 20 Min. einwirken lassen. Danach an einem Stück von der Haut abziehen. Evtl. Reste mit Wasser abnehmen. Die Maske sollte 1-2 mal in der Woche angewendet werden.